Our passion for growing and creating exceptional single vineyard wines, complete from vine to bottle, starts with the vineyard. In pursuit of finding the perfect terroir, winemaker Pieter Koopman discovered our idyllic forty-acre site of gently rolling hills, located in Hawkes Bay at the edge of the Heretaunga plains. Its north facing limestone slopes bask in abundant sunlight and warmth and the panoramic views sweep across the plains from the Ranges to Te Mata Peak, providing an idyllic site for our family-owned Estate to consistently produce fruit of optimum ripeness and flavour. 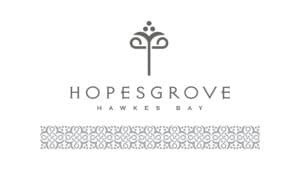 Originally planted in a variety of olives by Eddie Hope in the 1980’s, the Koopmans decided to retain the “Old Olive Block” and continue producing the award winning olive oil, ‘HopesGrove’. Pieter’s establishment of the vineyard in 2006 integrated Burgundy and northern Rhone varietals, rootstocks, and clones, selectively matched to the property’s site-specific microclimates, and in 2009 he crafted the first vintage of HopesGrove wines. They are made exclusively from our Estate grown, hand harvested fruit, reflecting our philosophy that ‘less is more’, and that wine should reveal a pure expression of its unique terroir. Pieter’s passion for quality is unwavering in his continued pursuit to reveal the fundamental structure, texture and expression of the fruit. His daily involvement and comprehensive, hands-on vineyard care has forged a strong bond with his winemaking, and keeps him attuned to the vines, the weather, and the soil. Sustaining a balanced canopy with low yield, high quality fruit ensures vintage stability and complements the solid base from which he creates our distinctive wines of outstanding quality.